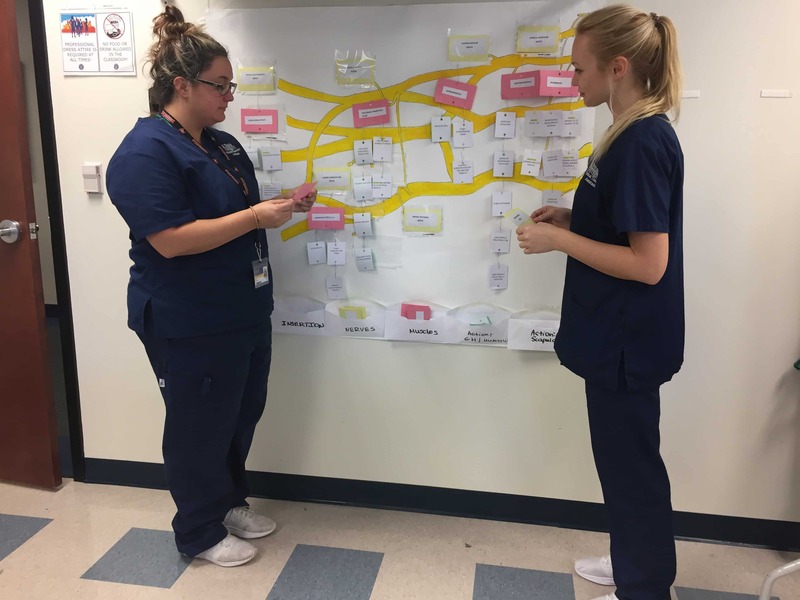 Two Physical Therapist Assistant (PTA) students from cohort 18 at the Jacksonville campus, Jordan Torres and Iulia Vartanov, are utilizing a hands-on learning activity geared towards understanding the brachial plexus. The brachial plexus is an intricate network of nerves that begins in the neck and controls all of the muscles in the arm and hand. In order to effectively treat patients with neuromuscular dysfunctions of the upper extremity, knowledge of the functionality of the brachial plexus is essential. A PTA student needs to have the ability to identify all of the nerves that arise from the plexus, as well as all of the muscles they control, along with the muscle’s location and actions. With this activity, the students select various cards with either muscle names, actions, and/or nerve names and place them in the appropriate location of the correlating brachial plexus.